These highlights do not include all the information needed to use IMATINIB MESYLATE TABLETS safely and effectively. See full prescribing information for IMATINIB MESYLATE TABLETS. All doses of imatinib mesylate tablets should be taken with a meal and a large glass of water. Doses of 400 mg or 600 mg should be administered once daily, whereas a dose of 800 mg should be administered as 400 mg twice a day. Imatinib mesylate tablets can be dissolved in water or apple juice for patients having difficulty swallowing. Daily dosing of 800 mg and above should be accomplished using the 400 mg tablet to reduce exposure to iron. The recommended dose of imatinib mesylate tablets is 400 mg/day for adult patients in chronic phase CML and 600 mg/day for adult patients in accelerated phase or blast crisis. The recommended dose of imatinib mesylate tablets for children with newly diagnosed Ph+ CML is 340 mg/m2/day (not to exceed 600 mg). Imatinib mesylate tablet treatment can be given as a once daily dose or the daily dose may be split into two–one portion dosed in the morning and one portion in the evening. There is no experience with imatinib mesylate tablet treatment in children under 1 year of age. The recommended dose of imatinib mesylate tablets is 600 mg/day for adult patients with relapsed/refractory Ph+ ALL. The recommended dose of imatinib mesylate tablets is 400 mg/day for adult patients with MDS/MPD. The recommended dose of imatinib mesylate tablets is 400 mg/day for adult patients with ASM without the D816V c-Kit mutation. If c-Kit mutational status is not known or unavailable, treatment with imatinib mesylate tablets 400 mg/day may be considered for patients with ASM not responding satisfactorily to other therapies. For patients with ASM associated with eosinophilia, a clonal hematological disease related to the fusion kinase FIP1L1-PDGFRα, a starting dose of 100 mg/day is recommended. Dose increase from 100 mg to 400 mg for these patients may be considered in the absence of adverse drug reactions if assessments demonstrate an insufficient response to therapy. The recommended dose of imatinib mesylate tablets is 400 mg/day for adult patients with HES/CEL. For HES/CEL patients with demonstrated FIP1L1-PDGFRα fusion kinase, a starting dose of 100 mg/day is recommended. Dose increase from 100 mg to 400 mg for these patients may be considered in the absence of adverse drug reactions if assessments demonstrate an insufficient response to therapy. The recommended dose of imatinib mesylate tablets is 800 mg/day for adult patients with DFSP. Renal Impairment: Patients with moderate renal impairment (CrCL = 20 to 39 mL/min) should receive a 50% decrease in the recommended starting dose and future doses can be increased as tolerated. Doses greater than 600 mg are not recommended in patients with mild renal impairment (CrCL = 40 to 59 mL/min). For patients with moderate renal impairment doses greater than 400 mg are not recommended. If elevations in bilirubin greater than 3 times the institutional upper limit of normal (IULN) or in liver transaminases greater than 5 times the IULN occur, imatinib mesylate tablets should be withheld until bilirubin levels have returned to a less than 1.5 times the IULN and transaminase levels to less than 2.5 times the IULN. 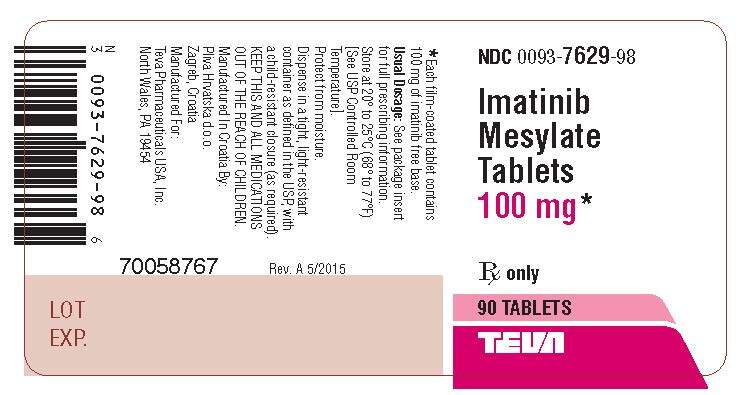 In adults, treatment with imatinib mesylate tablets may then be continued at a reduced daily dose (i.e., 400 mg to 300 mg, 600 mg to 400 mg or 800 mg to 600 mg). In children, daily doses can be reduced under the same circumstances from 340 mg/m2/day to 260 mg/m2/day. Orange to brown, film-coated, round-shaped tablet, scored on one side and debossed with "TE" on the left side of the score and with "VA" on the right side of the score and debossed with "7629" on the other side of the tablet. Orange to brown, film-coated, modified capsule-shaped tablet, scored on one side and debossed with "TE" on the left side of the score and with "VA" on the right side of the score and debossed with "7630" on the other side of the tablet. Imatinib mesylate is often associated with edema and occasionally serious fluid retention [see Adverse Reactions (6.1)]. Weigh and monitor patients regularly for signs and symptoms of fluid retention. Investigate unexpected rapid weight gain carefully and provide appropriate treatment. The probability of edema was increased with higher imatinib mesylate dose and age greater than 65 years in the CML studies. Severe superficial edema was reported in 1.5% of newly diagnosed CML patients taking imatinib mesylate, and in 2% to 6% of other adult CML patients taking imatinib mesylate. In addition, other severe fluid retention (e.g., pleural effusion, pericardial effusion, pulmonary edema, and ascites) reactions were reported in 1.3% of newly diagnosed CML patients taking imatinib mesylate, and in 2% to 6% of other adult CML patients taking imatinib mesylate. In a randomized trial in patients with newly diagnosed Ph+ CML in chronic phase comparing imatinib mesylate and nilotinib, severe (Grade 3 or 4) fluid retention occurred in 2.5% of patients receiving imatinib mesylate and in 3.9% of patients receiving nilotinib 300 mg twice daily. Effusions (including pleural effusion, pericardial effusion, ascites) or pulmonary edema were observed in 2.1% (none were Grade 3 or 4) of patients in the imatinib mesylate arm and 2.2% (0.7% Grade 3 or 4) of patients in the nilotinib 300 mg twice daily arm. Treatment with imatinib mesylate is associated with anemia, neutropenia, and thrombocytopenia. Perform complete blood counts weekly for the first month, biweekly for the second month, and periodically thereafter as clinically indicated (for example, every 2 to 3 months). In CML, the occurrence of these cytopenias is dependent on the stage of disease and is more frequent in patients with accelerated phase CML or blast crisis than in patients with chronic phase CML. In pediatric CML patients the most frequent toxicities observed were Grade 3 or 4 cytopenias including neutropenia, thrombocytopenia and anemia. These generally occur within the first several months of therapy [see Dosage and Administration (2.14)]. Congestive heart failure and left ventricular dysfunction have been reported in patients taking imatinib mesylate. Cardiac adverse reactions were more frequent in patients with advanced age or co-morbidities including previous medical history of cardiac disease. 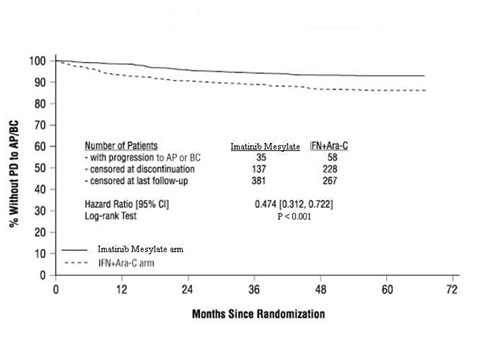 In an international randomized Phase 3 study in 1,106 patients with newly diagnosed Ph+ CML in chronic phase, severe cardiac failure and left ventricular dysfunction were observed in 0.7% of patients taking imatinib mesylate compared to 0.9% of patients taking IFN+Ara-C. 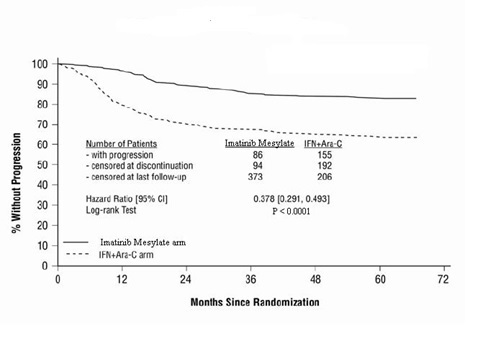 In another randomized trial with newly diagnosed Ph+ CML patients in chronic phase that compared imatinib mesylate and nilotinib, cardiac failure was observed in 1.1% of patient in the imatinib mesylate arm and 2.2% of patients in the nilotinib 300 mg twice daily arm and severe (Grade 3 or 4) cardiac failure occurred in 0.7% of patients in each group. Carefully monitor patients with cardiac disease or risk factors for cardiac or history of renal failure. Evaluate and treat any patient with signs or symptoms consistent with cardiac or renal failure. Imatinib mesylate is sometimes associated with GI irritation. Imatinib mesylate should be taken with food and a large glass of water to minimize this problem. There have been rare reports, including fatalities, of gastrointestinal perforation. Bullous dermatologic reactions, including erythema multiforme and Stevens-Johnson syndrome, have been reported with use of imatinib mesylate. In some cases of bullous dermatologic reactions, including erythema multiforme and Stevens-Johnson syndrome reported during postmarketing surveillance, a recurrent dermatologic reaction was observed upon re-challenge. Several foreign postmarketing reports have described cases in which patients tolerated the reintroduction of imatinib mesylate therapy after resolution or improvement of the bullous reaction. In these instances, imatinib mesylate was resumed at a dose lower than that at which the reaction occurred and some patients also received concomitant treatment with corticosteroids or antihistamines. Clinical cases of hypothyroidism have been reported in thyroidectomy patients undergoing levothyroxine replacement during treatment with imatinib mesylate. Monitor TSH levels in such patients. Imatinib mesylate can cause fetal harm when administered to a pregnant woman. Imatinib mesylate was teratogenic in rats when administered during organogenesis at doses approximately equal to the maximum human dose of 800 mg/day based on body surface area. Significant post-implantation loss was seen in female rats administered imatinib mesylate at doses approximately one-half the maximum human dose of 800 mg/day based on body surface area. Advise sexually active female patients of reproductive potential to use effective contraception (methods that result in less than 1% pregnancy rates) when using imatinib mesylate and for 14 days after stopping imatinib mesylate. If this drug is used during pregnancy or if the patient becomes pregnant while taking this drug, apprise the patient of the potential hazard to a fetus [see Use in Specific Populations (8.1)]. Growth retardation has been reported in children and pre-adolescents receiving imatinib mesylate. The long term effects of prolonged treatment with imatinib mesylate on growth in children are unknown. Therefore, monitor growth in children under imatinib mesylate treatment [see Adverse Reactions (6.1)]. Cases of Tumor Lysis Syndrome (TLS), including fatal cases, have been reported in patients with CML, ALL and eosinophilic leukemia receiving imatinib mesylate. The patients at risk of TLS are those with tumors having a high proliferative rate or high tumor burden prior to treatment. Monitor these patients closely and take appropriate precautions. Due to possible occurrence of TLS, correct clinically significant dehydration and treat high uric acid levels prior to initiation of imatinib mesylate. Motor vehicle accidents have been reported in patients receiving imatinib mesylate. Advise patients that they may experience side effects such as dizziness, blurred vision or somnolence during treatment with imatinib mesylate. Recommend caution when driving a car or operating machinery. A decline in renal function may occur in patients receiving imatinib mesylate. Median estimated glomerular filtration rate (eGFR) values in patients on imatinib mesylate 400 mg daily for newly-diagnosed CML (four randomized trials) and malignant GIST (one single-arm trial) declined from a baseline value of 85 ml/min/1.73m2 (N = 1190) to 75 ml/min/1.73m2 at 12 months (N = 1082) and 69 ml/min/1.73m2 at 60 months (N = 549). Evaluate renal function prior to initiating imatinib mesylate and monitor during therapy, with attention to risk factors for renal dysfunction such as preexisting renal impairment, diabetes mellitus, hypertension, and congestive heart failure. The majority of imatinib mesylate-treated patients experienced adverse reactions at some time. Imatinib mesylate was discontinued due to drug-related adverse reactions in 2.4% of patients receiving imatinib mesylate in the randomized trial of newly diagnosed patients with Ph+ CML in chronic phase comparing imatinib mesylate versus IFN+Ara-C, and in 12.5% of patients receiving imatinib mesylate in the randomized trial of newly diagnosed patients with Ph+ CML in chronic phase comparing imatinib mesylate and nilotinib. Imatinib mesylate was discontinued due to drug-related adverse reactions in 4% of patients in chronic phase after failure of interferon-alpha therapy, in 4% of patients in accelerated phase and in 5% of patients in blast crisis. The most frequently reported drug-related adverse reactions were edema, nausea and vomiting, muscle cramps, musculoskeletal pain, diarrhea and rash (Table 2 and Table 3 for newly diagnosed CML, Table 4 for other CML patients). Edema was most frequently periorbital or in lower limbs and was managed with diuretics, other supportive measures, or by reducing the dose of imatinib mesylate [see Dosage and Administration (2.13)]. The frequency of severe superficial edema was 1.5% to 6%. All adverse reactions occurring in greater than or equal to 10% of imatinib mesylate treated patients are listed regardless of suspected relationship to treatment. Other fluid retention reactions include pleural effusion, ascites, pulmonary edema, pericardial effusion, anasarca, edema aggravated, and fluid retention not otherwise specified. All adverse reactions occurring in greater than or equal to 10% of patients are listed regardless of suspected relationship to treatment. In patients with newly diagnosed CML, cytopenias were less frequent than in the other CML patients (see Tables 5, 6, and 7). The frequency of Grade 3 or 4 neutropenia and thrombocytopenia was between 2 and 3 fold higher in blast crisis and accelerated phase compared to chronic phase (see Tables 4 and 5). The median duration of the neutropenic and thrombocytopenic episodes varied from 2 to 3 weeks, and from 2 to 4 weeks, respectively. The following additional adverse reactions have been identified during post approval use of imatinib mesylate. Because these reactions are reported voluntarily from a population of uncertain size, it is not always possible to reliably estimate their frequency or establish a causal relationship to drug exposure. Concomitant administration of imatinib mesylate and strong CYP3A4 inducers may reduce total exposure of imatinib; consider alternative agents [see Clinical Pharmacology (12.3)]. Concomitant administration of imatinib mesylate and strong CYP3A4 inhibitors may result in a significant imatinib exposure increase. Grapefruit juice may also increase plasma concentrations of imatinib; avoid grapefruit juice [see Clinical Pharmacology (12.3)]. 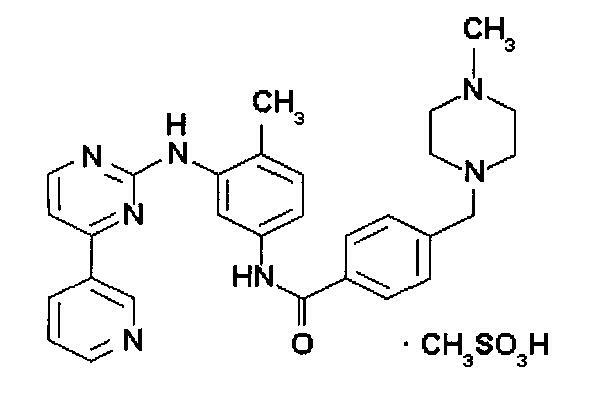 Imatinib mesylate will increase plasma concentration of CYP3A4 metabolized drugs (e.g., triazolo-benzodiazepines, dihydropyridine calcium channel blockers, certain HMG-CoA reductase inhibitors, etc.). Use caution when administering imatinib mesylate with CYP3A4 substrates that have a narrow therapeutic window. Imatinib mesylate can cause fetal harm when administered to a pregnant woman based on human and animal data. There are no clinical studies regarding use of imatinib mesylate in pregnant women. There have been postmarket reports of spontaneous abortions and congenital anomalies from women who have been exposed to imatinib mesylate during pregnancy. Reproductive studies in rats have demonstrated that imatinib mesylate induced teratogenicity and increased incidence of congenital abnormalities following prenatal exposure to imatinib mesylate at doses equal to the highest recommended human dose of 800 mg/day based on body surface area. Advise women to avoid pregnancy when taking imatinib mesylate. If this drug is used during pregnancy, or if the patient becomes pregnant while taking this drug, apprise the patient of the potential hazard to the fetus. The background risk of major birth defects and miscarriage for the indicated population is not known; however, in the U.S. general population, the estimated background risk of major birth defects of clinically recognized pregnancies is 2 to 4% and of miscarriage is 15% to 20%. Based on data from 3 breastfeeding women taking imatinib mesylate, the milk:plasma ratio is about 0.5 for imatinib and about 0.9 for the active metabolite. Considering the combined concentration of imatinib and active metabolite, a breastfed infant could receive up to 10% of the maternal therapeutic dose based on body weight. Human postmarketing reports and animal studies have shown imatinib mesylate to be harmful to the developing fetus. Test pregnancy status in females with reproductive potential prior to the initiation of treatment with imatinib mesylate. Advise female patients of reproductive potential to use effective contraception (methods that result in less than 1% pregnancy rates) when using imatinib mesylate during treatment and for fourteen days after stopping treatment with imatinib mesylate [see Use in Specific Populations (8.1)]. The safety and effectiveness of imatinib mesylate have been demonstrated in pediatric patients with newly diagnosed Ph+ chronic phase CML [see Clinical Studies (14.2)]. There are no data in children under 1 year of age. The effect of renal impairment on the pharmacokinetics of imatinib was assessed in 59 patients with cancer and varying degrees of renal impairment at single and steady state imatinib doses ranging from 100 to 800 mg/day. The mean exposure to imatinib (dose normalized AUC) in patients with mild and moderate renal impairment increased 1.5 to 2 fold compared to patients with normal renal function. There are not sufficient data in patients with severe renal impairment [see Clinical Pharmacology (12.3)]. Dose reductions are necessary for patients with moderate and severe renal impairment [see Dosage and Administration (2.12)]. A patient with myeloid blast crisis experienced Grade 1 elevations of serum creatinine, Grade 2 ascites and elevated liver transaminase levels, and Grade 3 elevations of bilirubin after inadvertently taking 1,200 mg of imatinib mesylate daily for 6 days. Therapy was temporarily interrupted and complete reversal of all abnormalities occurred within 1 week. Treatment was resumed at a dose of 400 mg daily without recurrence of adverse reactions. Another patient developed severe muscle cramps after taking 1,600 mg of imatinib mesylate daily for 6 days. Complete resolution of muscle cramps occurred following interruption of therapy and treatment was subsequently resumed. Another patient that was prescribed 400 mg daily, took 800 mg of imatinib mesylate on Day 1 and 1,200 mg on Day 2. Therapy was interrupted, no adverse reactions occurred and the patient resumed therapy. 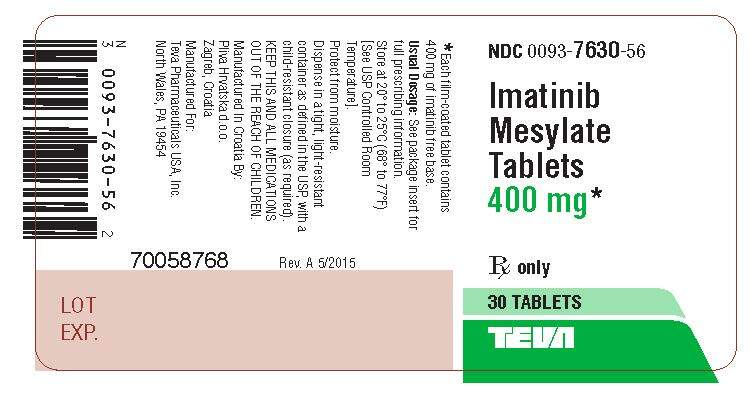 Imatinib mesylate is a white to off-white to brownish or yellowish powder. Imatinib mesylate is very soluble in water and soluble in aqueous buffers less than or equal to pH 5.5, but is very slightly soluble to insoluble in neutral/alkaline aqueous buffers. It is soluble in polar solvents, but only slightly soluble to insoluble in low polar solvents. Imatinib mesylate is freely soluble to very slightly soluble in dimethyl sulfoxide, methanol and ethanol, but is insoluble in n-octanol, acetone and acetonitrile. The free base has very low solubility in water (0.001 g/100 mL) and in aqueous solutions that are slightly alkaline. Inactive Ingredients: colloidal silicon dioxide, croscarmellose sodium, crospovidone, FD&C Yellow #6 Sunset Yellow FCF aluminum lake, hydroxypropyl cellulose, hypromellose, iron oxide yellow, lactose monohydrate, magnesium stearate, microcrystalline cellulose, sodium stearyl fumarate, talc, and titanium dioxide. Imatinib is well absorbed after oral administration with Cmax achieved within 2 to 4 hours post-dose. Mean absolute bioavailability is 98%. Mean imatinib AUC increases proportionally with increasing doses ranging from 25 mg to 1,000 mg. There is no significant change in the pharmacokinetics of imatinib on repeated dosing, and accumulation is 1.5 to 2.5 fold at steady state when imatinib mesylate is dosed once daily. At clinically relevant concentrations of imatinib, binding to plasma proteins in in vitro experiments is approximately 95%, mostly to albumin and α1-acid glycoprotein. CYP3A4 is the major enzyme responsible for metabolism of imatinib. Other cytochrome P450 enzymes, such as CYP1A2, CYP2D6, CYP2C9, and CYP2C19, play a minor role in its metabolism. The main circulating active metabolite in humans is the N-demethylated piperazine derivative, formed predominantly by CYP3A4. It shows in vitro potency similar to the parent imatinib. The plasma AUC for this metabolite is about 15% of the AUC for imatinib. The plasma protein binding of N-demethylated metabolite CGP74588 is similar to that of the parent compound. Human liver microsome studies demonstrated that imatinib mesylate is a potent competitive inhibitor of CYP2C9, CYP2D6, and CYP3A4/5 with Ki values of 27, 7.5, and 8 µM, respectively. Pretreatment of healthy volunteers with multiple doses of rifampin followed by a single dose of imatinib mesylate, increased imatinib mesylate oral-dose clearance by 3.8 fold, which significantly (p less than 0.05) decreased mean Cmax and AUC. Similar findings were observed in patients receiving 400 to 1200 mg/day imatinib mesylate concomitantly with enzyme-inducing anti-epileptic drugs (EIAED) (e.g., carbamazepine, oxcarbamazepine, phenytoin, fosphenytoin, phenobarbital, and primidone). The mean dose normalized AUC for imatinib in the patients receiving EIAED’s decreased by 73% compared to patients not receiving EIAED. Concomitant administration of imatinib mesylate and St. John’s Wort led to a 30% reduction in the AUC of imatinib. Consider alternative therapeutic agents with less enzyme induction potential in patients when rifampin or other CYP3A4 inducers are indicated. Imatinib mesylate doses up to 1200 mg/day (600 mg twice daily) have been given to patients receiving concomitant strong CYP3A4 inducers [see Dosage and Administration (2.12)]. There was a significant increase in exposure to imatinib (mean Cmax and AUC increased by 26% and 40%, respectively) in healthy subjects when imatinib mesylate was coadministered with a single dose of ketoconazole (a CYP3A4 inhibitor). Caution is recommended when administering imatinib mesylate with strong CYP3A4 inhibitors (e.g., ketoconazole, itraconazole, clarithromycin, atazanavir, indinavir, nefazodone, nelfinavir, ritonavir, saquinavir, telithromycin, and voriconazole). Grapefruit juice may also increase plasma concentrations of imatinib and should be avoided. Imatinib mesylate increases the mean Cmax and AUC of simvastatin (CYP3A4 substrate) 2- and 3.5-fold, respectively, suggesting an inhibition of the CYP3A4 by imatinib mesylate. Particular caution is recommended when administering imatinib mesylate with CYP3A4 substrates that have a narrow therapeutic window (e.g., alfentanil, cyclosporine, diergotamine, ergotamine, fentanyl, pimozide, quinidine, sirolimus or tacrolimus). Imatinib mesylate will increase plasma concentration of other CYP3A4 metabolized drugs (e.g., triazolo-benzodiazepines, dihydropyridine calcium channel blockers, certain HMG-CoA reductase inhibitors, etc.). Imatinib mesylate increased the mean Cmax and AUC of metoprolol by approximately 23% suggesting that imatinib mesylate has a weak inhibitory effect on CYP2D6-mediated metabolism. No dose adjustment is necessary, however, caution is recommended when administering imatinib mesylate with CYP2D6 substrates that have a narrow therapeutic window. In vitro, imatinib mesylate inhibits the acetaminophen O-glucuronidate pathway (Ki 58.5 μM). Coadministration of imatinib mesylate (400 mg/day for 8 days) with acetaminophen (1000 mg single dose on day 8) in patients with CML did not result in any changes in the pharmacokinetics of acetaminophen. Imatinib mesylate pharmacokinetics were not altered in the presence of single-dose acetaminophen. There is no pharmacokinetic or safety data on the concomitant use of imatinib mesylate at doses greater than 400 mg/day or the chronic use of concomitant acetaminophen and imatinib mesylate. In the 2 year rat carcinogenicity study administration of imatinib at 15, 30, and 60 mg/kg/day resulted in a statistically significant reduction in the longevity of males at 60 mg/kg/day and females at greater than or equal to 30 mg/kg/day. Target organs for neoplastic changes were the kidneys (renal tubule and renal pelvis), urinary bladder, urethra, preputial and clitoral gland, small intestine, parathyroid glands, adrenal glands and non-glandular stomach. Neoplastic lesions were not seen at: 30 mg/kg/day for the kidneys, urinary bladder, urethra, small intestine, parathyroid glands, adrenal glands and non-glandular stomach, and 15 mg/kg/day for the preputial and clitoral gland. The papilloma/carcinoma of the preputial/clitoral gland were noted at 30 and 60 mg/kg/day, representing approximately 0.5 to 4 or 0.3 to 2.4 times the human daily exposure (based on AUC) at 400 mg/day or 800 mg/day, respectively, and 0.4 to 3.0 times the daily exposure in children (based on AUC) at 340 mg/m2. The renal tubule adenoma/carcinoma, renal pelvis transitional cell neoplasms, the urinary bladder and urethra transitional cell papillomas, the small intestine adenocarcinomas, the parathyroid glands adenomas, the benign and malignant medullary tumors of the adrenal glands and the non-glandular stomach papillomas/carcinomas were noted at 60 mg/kg/day. The relevance of these findings in the rat carcinogenicity study for humans is not known. Positive genotoxic effects were obtained for imatinib in an in vitro mammalian cell assay (Chinese hamster ovary) for clastogenicity (chromosome aberrations) in the presence of metabolic activation. Two intermediates of the manufacturing process, which are also present in the final product, are positive for mutagenesis in the Ames assay. One of these intermediates was also positive in the mouse lymphoma assay. Imatinib was not genotoxic when tested in an in vitro bacterial cell assay (Ames test), an in vitro mammalian cell assay (mouse lymphoma) and an in vivo rat micronucleus assay. It is important to consider potential toxicities suggested by animal studies, specifically, liver, kidney, and cardiac toxicity and immunosuppression. Severe liver toxicity was observed in dogs treated for 2 weeks, with elevated liver enzymes, hepatocellular necrosis, bile duct necrosis, and bile duct hyperplasia. Renal toxicity was observed in monkeys treated for 2 weeks, with focal mineralization and dilation of the renal tubules and tubular nephrosis. Increased BUN and creatinine were observed in several of these animals. An increased rate of opportunistic infections was observed with chronic imatinib treatment in laboratory animal studies. In a 39 week monkey study, treatment with imatinib resulted in worsening of normally suppressed malarial infections in these animals. Lymphopenia was observed in animals (as in humans). Additional long-term toxicities were identified in a 2 year rat study. Histopathological examination of the treated rats that died on study revealed cardiomyopathy (both sexes), chronic progressive nephropathy (females) and preputial gland papilloma as principal causes of death or reasons for sacrifice. Non-neoplastic lesions seen in this 2 year study which were not identified in earlier preclinical studies were the cardiovascular system, pancreas, endocrine organs and teeth. The most important changes included cardiac hypertrophy and dilatation, leading to signs of cardiac insufficiency in some animals. A total of 71 (12.8%) and 85 (15.4%) patients died in the imatinib mesylate and IFN+Ara-C group, respectively. At 84 months the estimated overall survival is 86.4% (83, 90) vs. 83.3% (80, 87) in the randomized imatinib mesylate and the IFN+Ara-C group, respectively (p = 0.073 log-rank test). The hazard ratio is 0.750 with 95% CI 0.547 to 1.028. This time-to-event endpoint may be affected by the high crossover rate from IFN+Ara-C to imatinib mesylate. Major cytogenetic response, hematologic response, evaluation of minimal residual disease (molecular response), time to accelerated phase or blast crisis and survival were main secondary endpoints. Response data are shown in Table 18. Complete hematologic response, major cytogenetic response and complete cytogenetic response were also statistically significantly higher in the imatinib mesylate arm compared to the IFN+Ara-C arm (no cross-over data considered for evaluation of responses). Median time to CCyR in the 454 responders was 6 months (range 2 to 64 months, 25th to 75th percentiles = 3 to 11 months) with 10% of responses seen only after 22 months of therapy. Hematologic response criteria (all responses to be confirmed after greater than or equal to 4 weeks): WBC less than 10 x 10 9/L, platelet less than 450 x 10 9/L, myelocyte + metamyelocyte less than 5% in blood, no blasts and promyelocytes in blood, no extramedullary involvement. Cytogenetic response criteria (confirmed after greater than or equal to 4 weeks): complete (0% Ph+ metaphases) or partial (1% to 35%). A major response (0% to 35%) combines both complete and partial responses. Unconfirmed cytogenetic response is based on a single bone marrow cytogenetic evaluation, therefore unconfirmed complete or partial cytogenetic responses might have had a lesser cytogenetic response on a subsequent bone marrow evaluation. Molecular response was defined as follows: in the peripheral blood, after 12 months of therapy, reduction of greater than or equal to 3 logarithms in the amount of BCR-ABL transcripts (measured by real-time quantitative reverse transcriptase PCR assay) over a standardized baseline. Molecular response was only evaluated in a subset of patients who had a complete cytogenetic response by 12 months or later (N = 333). The molecular response rate in patients who had a complete cytogenetic response in the imatinib mesylate arm was 59% at 12 months and 72% at 24 months. Physical, functional, and treatment-specific biologic response modifier scales from the FACT-BRM (Functional Assessment of Cancer Therapy - Biologic Response Modifier) instrument were used to assess patient-reported general effects of interferon toxicity in 1,067 patients with CML in chronic phase. After one month of therapy to 6 months of therapy, there was a 13% to 21% decrease in median index from baseline in patients treated with IFN, consistent with increased symptoms of IFN toxicity. There was no apparent change from baseline in median index for patients treated with imatinib mesylate. An open-label, multicenter, randomized trial (imatinib mesylate versus nilotinib) was conducted to determine the efficacy of imatinib mesylate versus nilotinib in adult patients with cytogenetically confirmed, newly diagnosed Ph+ CML-CP. Patients were within 6 months of diagnosis and were previously untreated for CML-CP, except for hydroxyurea and/or anagrelide. Efficacy was based on a total of 846 patients: 283 patients in the imatinib mesylate 400 mg once daily group, 282 patients in the nilotinib 300 mg twice daily group, 281 patients in the nilotinib 400 mg twice daily group. Median age was 46 years in the imatinib mesylate group and 47 years in both nilotinib groups, with 12%, 13%, and 10% of patients greater than or equal to 65 years of age in imatinib mesylate 400 mg once-daily, nilotinib 300 mg twice-daily and nilotinib 400 mg twice-daily treatment groups, respectively. There were slightly more male than female patients in all groups (56%, 56%, and 62% in imatinib mesylate 400 mg once-daily, nilotinib 300 mg twice-daily and nilotinib 400 mg twice-daily treatment groups, respectively). More than 60% of all patients were Caucasian, and 25% were Asian. CCyR: 0% Ph+ metaphases. Cytogenetic responses were based on the percentage of Ph-positive metaphases among greater than or equal to 20 metaphase cells in each bone marrow sample. Median overall survival was not reached in either arm. At the time of the 60 month final analysis, the estimated survival rate was 91.7% for patients on imatinib mesylate and 93.7% for patients on nilotinib. Effectiveness was evaluated primarily on the basis of the rate of hematologic response, reported as either complete hematologic response, no evidence of leukemia (i.e., clearance of blasts from the marrow and the blood, but without a full peripheral blood recovery as for complete responses), or return to chronic phase CML. Cytogenetic responses were also evaluated. Median duration of treatment was 18 months with 45% of patients treated for greater than or equal to 24 months (maximum = 35 months). Efficacy results are reported in Table 20. Response rates in accelerated phase CML were higher for the 600 mg dose group than for the 400 mg group: hematologic response (75% vs. 64%), confirmed and unconfirmed major cytogenetic response (31% vs. 19%). Effectiveness was evaluated primarily on the basis of rate of hematologic response, reported as either complete hematologic response, no evidence of leukemia, or return to chronic phase CML using the same criteria as for the study in accelerated phase. Cytogenetic responses were also assessed. Median duration of treatment was 4 months with 21% of patients treated for greater than or equal to 12 months and 10% for greater than or equal to 24 months (maximum = 35 months). Efficacy results are reported in Table 20. The hematologic response rate was higher in untreated patients than in treated patients (36% vs. 22%, respectively) and in the group receiving an initial dose of 600 mg rather than 400 mg (33% vs. 16%). The confirmed and unconfirmed major cytogenetic response rate was also higher for the 600 mg dose group than for the 400 mg dose group (17% vs. 8%). Complete cytogenetic response confirmed by a second bone marrow cytogenetic evaluation performed at least 1 month after the initial bone marrow study. The median time to hematologic response was 1 month. In late chronic phase CML, with a median time from diagnosis of 32 months, an estimated 87.8% of patients who achieved MCyR maintained their response 2 years after achieving their initial response. After 2 years of treatment, an estimated 85.4% of patients were free of progression to AP or BC, and estimated overall survival was 90.8% [88.3, 93.2]. In accelerated phase, median duration of hematologic response was 28.8 months for patients with an initial dose of 600 mg (16.5 months for 400 mg). An estimated 63.8% of patients who achieved MCyR were still in response 2 years after achieving initial response. The median survival was 20.9 [13.1, 34.4] months for the 400 mg group and was not yet reached for the 600 mg group (p = 0.0097). An estimated 46.2% [34.7, 57.7] vs. 65.8% [58.4, 73.3] of patients were still alive after 2 years of treatment in the 400 mg vs. 600 mg dose groups, respectively. In blast crisis, the estimated median duration of hematologic response is 10 months. An estimated 27.2% [16.8, 37.7] of hematologic responders maintained their response 2 years after achieving their initial response. Median survival was 6.9 [5.8, 8.6] months, and an estimated 18.3% [13.4, 23.3] of all patients with blast crisis were alive 2 years after start of study. A total of 51 pediatric patients with newly diagnosed and untreated CML in chronic phase were enrolled in an open-label, multicenter, single-arm Phase 2 trial. Patients were treated with imatinib mesylate 340 mg/m2/day, with no interruptions in the absence of dose limiting toxicity. Complete hematologic response (CHR) was observed in 78% of patients after 8 weeks of therapy. The complete cytogenetic response rate (CCyR) was 65%, comparable to the results observed in adults. Additionally, partial cytogenetic response (PCyR) was observed in 16%. The majority of patients who achieved a CCyR developed the CCyR between months 3 and 10 with a median time to response based on the Kaplan-Meier estimate of 6.74 months. Patients were allowed to be removed from protocol therapy to undergo alternative therapy including hematopoietic stem cell transplantation. Thirty-one children received stem cell transplantation. Of the 31 children, 5 were transplanted after disease progression on study and 1 withdrew from study during first week treatment and received transplant approximately 4 months after withdrawal. Twenty-five children withdrew from protocol therapy to undergo stem cell transplant after receiving a median of 9 twenty-eight day courses (range 4 to 24). Of the 25 patients 13 (52%) had CCyR and 5 (20%) had PCyR at the end of protocol therapy. One open-label, single-arm study enrolled 14 pediatric patients with Ph+ chronic phase CML recurrent after stem cell transplant or resistant to interferon-alpha therapy. These patients had not previously received imatinib mesylate and ranged in age from 3 to 20 years old; 3 were 3 to 11 years old, 9 were 12 to 18 years old, and 2 were greater than 18 years old. Patients were treated at doses of 260 mg/m2/day (n = 3), 340 mg/m2/day (n = 4), 440 mg/m2/day (n = 5) and 570 mg/m2/day (n = 2). In the 13 patients for whom cytogenetic data are available, 4 achieved a major cytogenetic response, 7 achieved a complete cytogenetic response, and 2 had a minimal cytogenetic response. An open-label, multicenter, Phase 2 clinical trial was conducted testing imatinib mesylate in diverse populations of patients suffering from life-threatening diseases associated with Abl, Kit or PDGFR protein tyrosine kinases. This study included 7 patients with MDS/MPD. These patients were treated with imatinib mesylate 400 mg daily. The ages of the enrolled patients ranged from 20 to 86 years. A further 24 patients with MDS/MPD aged 2 to 79 years were reported in 12 published case reports and a clinical study. These patients also received imatinib mesylate at a dose of 400 mg daily with the exception of three patients who received lower doses. Of the total population of 31 patients treated for MDS/MPD, 14 (45%) achieved a complete hematological response and 12 (39%) a major cytogenetic response (including 10 with a complete cytogenetic response). Sixteen patients had a translocation, involving chromosome 5q33 or 4q12, resulting in a PDGFR gene re-arrangement. All of these patients responded hematologically (13 completely). Cytogenetic response was evaluated in 12 out of 14 patients, all of whom responded (10 patients completely). Only 1 (7%) out of the 14 patients without a translocation associated with PDGFR gene re-arrangement achieved a complete hematological response and none achieved a major cytogenetic response. A further patient with a PDGFR gene re-arrangement in molecular relapse after bone marrow transplant responded molecularly. Median duration of therapy was 12.9 months (0.8 to 26.7) in the 7 patients treated within the Phase 2 study and ranged between 1 week and more than 18 months in responding patients in the published literature. Results are provided in Table 22. Response durations of Phase 2 study patients ranged from 141+ days to 457+ days. One open-label, multicenter, Phase 2 study was conducted testing imatinib mesylate in diverse populations of patients with life-threatening diseases associated with Abl, Kit or PDGFR protein tyrosine kinases. This study included 5 patients with ASM treated with 100 mg to 400 mg of imatinib mesylate daily. These 5 patients ranged from 49 to 74 years of age. In addition to these 5 patients, 10 published case reports and case series describe the use of imatinib mesylate in 23 additional patients with ASM aged 26 to 85 years who also received 100 mg to 400 mg of imatinib mesylate daily. One open-label, multicenter, Phase 2 study was conducted testing imatinib mesylate in diverse populations of patients with life-threatening diseases associated with Abl, Kit or PDGFR protein tyrosine kinases. This study included 14 patients with Hypereosinophilic Syndrome/Chronic Eosinophilic Leukemia (HES/CEL). HES patients were treated with 100 mg to 1000 mg of imatinib mesylate daily. The ages of these patients ranged from 16 to 64 years. A further 162 patients with HES/CEL aged 11 to 78 years were reported in 35 published case reports and case series. These patients received imatinib mesylate at doses of 75 mg to 800 mg daily. Hematologic response rates are summarized in Table 24. Response durations for literature patients ranged from 6+ weeks to 44 months. An open-label, multicenter, Phase 2 study was conducted testing imatinib mesylate in a diverse population of patients with life-threatening diseases associated with Abl, Kit or PDGFR protein tyrosine kinases. This study included 12 patients with DFSP who were treated with imatinib mesylate 800 mg daily (age range 23 to 75 years). DFSP was metastatic, locally recurrent following initial surgical resection and not considered amenable to further surgery at the time of study entry. A further 6 DFSP patients treated with imatinib mesylate are reported in 5 published case reports, their ages ranging from 18 months to 49 years. The total population treated for DFSP therefore comprises 18 patients, 8 of them with metastatic disease. The adult patients reported in the published literature were treated with either 400 mg (4 cases) or 800 mg (1 case) imatinib mesylate daily. A single pediatric patient received 400 mg/m2/daily, subsequently increased to 520 mg/m2/daily. Ten patients had the PDGF B gene rearrangement, 5 had no available cytogenetics and 3 had complex cytogenetic abnormalities. Responses to treatment are described in Table 25. 100 mg - orange to brown, film-coated, round-shaped tablet, scored on one side and debossed with "TE" on the left side of the score and with "VA" on the right side of the score and debossed with "7629" on the other side of the tablet, in bottles of 90 (NDC 0093-7629-98). 400 mg - orange to brown, film-coated, modified capsule-shaped tablet, scored on one side and debossed with "TE" on the left side of the score and with "VA" on the right side of the score and debossed with "7630" on the other side of the tablet, in bottles of 30 (NDC 0093-7630-56). Do not crush imatinib mesylate tablets. Avoid direct contact of crushed tablets with the skin or mucous membranes. If such contact occurs, wash thoroughly as outlined in the references. Avoid exposure to crushed tablets. Advise patients to take imatinib mesylate tablets exactly as prescribed, not to change their dose or to stop taking imatinib mesylate tablets unless they are told to do so by their doctor. If the patient missed a dose of imatinib mesylate tablets, the patient should take the next scheduled dose at its regular time. The patient should not take two doses at the same time. Advise patients to take imatinib mesylate tablets with a meal and a large glass of water [see Dosage and Administration (2.1)]. Advise patients that growth retardation has been reported in children and pre-adolescents receiving imatinib mesylate tablets. The long term effects of prolonged treatment with imatinib mesylate tablets on growth in children are unknown. Therefore, closely monitor growth in children under imatinib mesylate tablet treatment [see Warnings and Precautions (5.11)]. Advise patients that they may experience side effects such as dizziness, blurred vision or somnolence during treatment with imatinib mesylate tablets. Therefore, caution patients about driving a car or operating machinery [see Warnings and Precautions (5.13)].